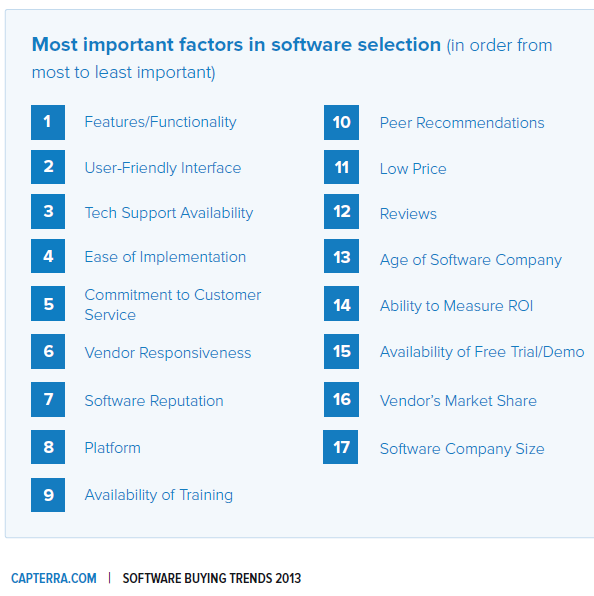 Software resource portal, Capterra, has recently published a report on the findings from a survey they ran which examined how organisations make decisions when buying software - and it makes interesting and sometimes scary reading. For example, "1/3 of software buyers don’t demo any solutions before they make a purchase" and "another 22% just choose the first software they look at!" And very interestingly, "the more demos and options that software buyers considered, the less confident they were in their selection." Hmm. Who gets involved with purchases? Of course, what is harder to quantify is what "involved" means for a purchasing decision. If it means being kept in touch and maybe ratification then that is very different to attending demos and making a final decision. What do people look for in software? One of the most interesting sections of the report is a table showing "The Most Important Factors in Software Selection". It's very interesting (some might say encouraging?) to see "Low price" and "Vendor's market share" so low in the table, and despite all the cloud-hype, "platform" is still only #9 on the list. Both "vendor responsiveness" and "software reputation" come above that - which shows how important the supplier itself is to the buyers. Perhaps unsurprisingly, "Features/functionality" is listed as the most important factor. It's hard to get away from that. This is of course one of the downsides of "lists" like this - yes, functionality is important, and, for example, I often drone on about how it doesn't matter if software is/isn't in the cloud if it can't operationally support a charity - but I always encourage charities to consider features as just a percentage of a decision making process. Equally (more?) important are all the other issues such as supplier support, ease of implementation and so on. So it's not quite as simple as saying that the #1 factor necessarily outweighs others. What can we learn from all this for a UK charity looking to buy new fundraising or CRM software? Can a survey taken across a variety of industry sectors in the US also apply to CRM software selection for UK non-profits? Well, 50% of the survey's respondents have less than 100 employees in their organisation and 64% less than 500, so that's not so far off. And the "important factors" list tallies with my experience of UK charities' processes - not that that makes it right unfortunately. (And if you look at Capterra's website, then the Fundraising & Membership Software lists include names such as Blackbaud, Donor Perfect and Wild Apricot, so these are not insignificant companies). Absorbing and understanding the information available about different software solutions. This therefore shows what you need to be doing and considering when buying software. Which, I realise, can be easier said than done. Which is why I hope that posts elsewhere on my blog give guidance to how you can address such concerns. And there are other great websites with other useful resources such as LASA's Knowledge Base and TechSoup; and the various sector events held by the Institute of Fundraising, sector media and exhibition conferences, all of which can also help - look out for the free seminars at some of these. And use your peers too - the experience of other charities does help. There are many more fascinating and enlightening stats in the report, not all of them so relevant to all the work we do in the UK fundraising/CRM software market, but still a great read! You can download the full report from Capterra's website.